In a wedding ceremony you allow yourself and your loved one to exchange a covenant of promises before God and a company of witnesses. You join your love together as one, making your vows in the presence of God. Our office staff can help with additional information and scheduling. When you choose baptism for your child or yourself, you choose to enter into a loving Christian community. We will stand with you in times of joy and heartbreak. Together, we will strive to help you or your child grow in Christ. Our office staff can help you with more information. Through memorial services we gather as a Faith community and give thanks to God in worship for the life of our loved ones. While we grieve, we do so with the hope and promise of resurrection and reunion. Throughout Christian history, believers have found the Church to be the center of their life experiences. It is a place where major life events are celebrated – Birth, Confirmation, Marriage, Spiritual Growth – and our Death. 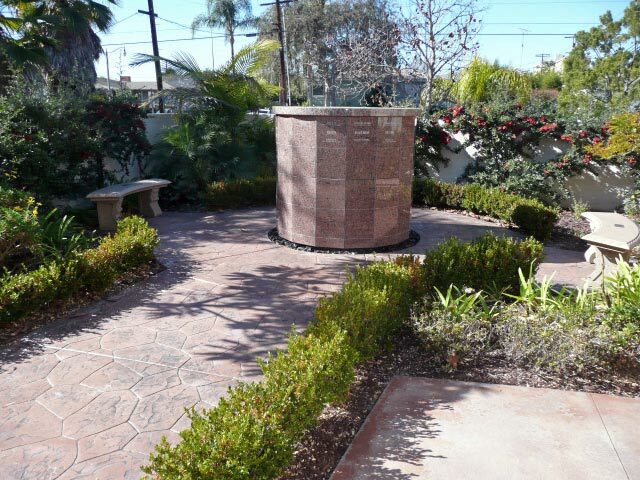 Recognizing this, Faith Presbyterian Church has created a Memorial Garden with a Columbarium for the permanent internment of cremated remains. It is a place to remind us that our Christian loved ones, though absent from us, are with our Lord in eternity. The Memorial Garden is a walled private place of beauty and tranquility, with walkways and benches amid tasteful landscaping. The Columbarium is a circular structure of Sunset Red Granite, providing 64 niches for placement of urns with the remains. Each niche can hold 1 or 2 urns. Each niche is engraved with the deceased’s full name and dates of birth and death.